This film wasn’t directed by George Lucas and he was only one of the three writers behind it. The director was Irvin Kershner and written by Leigh Brackett, Lawrence Kasden and George Lucas, while being produced by Gary Kurtz. The story involves the rebels on the run, having escaped to Hoth to hide from the Emperor as they are still strong after the destruction of the Death Star. Darth Vader is hunting them, hoping to destroy the Rebellion for good and capture and turn Luke Skywalker to the Dark Side. The Pros: The Soundtrack – The soundtrack is wonderful and John Williams captures the fear and terror the Empire so well as we are given the most desolate situation for the Rebellion as Darth Vader is successful in whatever he sets out to do. 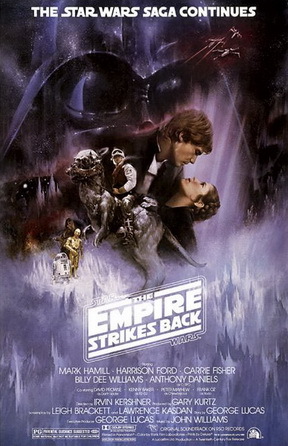 The Cinematography – The cinematography is beautiful, especially the Battle of Hoth and the Duel between Luke and Vader. The use of mist and shadows to increase the fear and tension among our characters and heroes is done masterfully. Peter Suschitzky did a great job. The Writing – The script is tight and fast and you can tell that Lucas was not the primary writer, though Lucas did do a great job on the script for the original version of “A New Hope,” to his credit. When he’s on a team he seems to be do better though. The Empire – The Empire is powerful in this and we see Cloud City, the Rebels on Hoth and the pursuit of the Millennium Falcon. Part of the reason I enjoy this film so much is the Empire feels like a threat and they never stop feeling like a threat. They force our heroes to escape the Galaxy and no longer have a home base as the Empire has chased them away from all their safe havens, captured on of their Captain’s and friends (Han Solo) and injured one of their leaders (Luke). The Empire has a firm win, even if it isn’t a total victory. The stakes are raised in this. The Rebellion – The Rebellion shows how resilient they are in this. We see that in the end, no matter how hurt they are (so many die in the Battle of Hoth) that they will keep going and resisting the Empire, and that is what makes them interesting. The Battle of Hoth – The Battle of Hoth is my favorite “Star Wars” battle besides the assault on the Death Star. The AT-ATs are beautiful machines that are deadly and take a lot to take down. We also see how deadly the Empire is again as they walk all over the Rebels as above we see Star Destroyers from their fleet. The Millennium Falcon on the Run – Han and Leia’s escape is a great arc. We see them forced together because they stuck around to make sure all the other Rebels escaped first and as a reward they are pursued by Vader himself through an Asteroid field and eventually by Bounty Hunters hunting them too. Through it Leia and Han fall in love as we see that they are both stubborn but have a huge respect for one another and notice how aware they can be with others. It is during the run we see Han grow up and stop pushing people away. Cloudy City – Cloud City is a great location. It’s Lando’s base and business and is neutral in the war until Vader goes back on his deals with Lando and we see Cloud City join the Rebellion and resist Imperial oppression. It is a great arc as we see Cloud City is a selfish place but there is good here too when Lando saves our heroes and tries to save the friend he betrayed. Luke’s Training – Luke’s training continues his heroes journey as we see him grow to look beyond appearances when Yoda reveals he is the Jedi Master and that his size does no matter as he raises Luke’s X-Wing out of the Swamp. In this we see Yoda is always forcing Luke to face himself and learn to let go, which Luke is not able to do as Darth Vader’s torture of his friends leads him leaving Dagoba even when Obi-Wan’s ghost and Yoda warn him how dire of a mistake it will be. Dagoba – Dobaba is a fantastic location! It is dark and smoggy and full of life. You get why Yoda chose this place when he explains how the force flows through all life forms. It is foreboding but beautiful in it’s own way too. The Characters – The Characters and their arcs are what make this film a classic and a favorite. More is done with them than in “A New Hope” and we see the choices they make that change them and help them to grow. Obi-Wan Kenobi – Obi-Wan is back as the mentor sending Luke to Dagoba and warning him about the challenge of facing Vader when he is not fully trained (which he would know having failed to kill his friend). There is a sadness to the character too as he can’t do anything a ghost but communicate with those already in connection with him. Yoda – Yoda is awesome and Frank Oz owns this role. He’s a compelling character, unlike the CGI one-dimensional pillow sitting Master we got in the Prequels. Yoda is a trickster yet full of wisdom as he pulls Luke out of his comfort zone and forces him to confront himself and what it means to use the Force. It is this film that made Yoda one of my favorite characters, and we never see this level of depth from the character again. Lando Calrissian – Billy Dee Wililams is awesome as the gambler who turns on his friend Han to save his people. He’s complicated and when you see the operation he runs you get why he made that terrible decision as he no doubt saw it as one life versus many. By the end he realizes he’s been tricked though and joins the Rebellion and tries to save Han to begin to atone for his betrayal. I really liked this character, he’s smooth, suave and owns his own city. Boba Fett – Fett is great. I really like his original voice as it shows someone who has been through a lot. His voice is raspy and we get an idea how deadly he is when Vader orders capture only and no disintegrations to Boba. Boba is the one who figures out how the Falcon escaped the fleet and tracks them to Cloud City. In the end he succeeds and is able to bring Jabba Han’s frozen body. Princess Leia – Leia is more passive in this after the Battle of Hoth than she is in Empire but we see she never stops being the one who figures things out first. She doesn’t trust Lando and we learn she is right to do and she comes around to Han showing that at this point Han has become a good person. She also tries to warn Luke, though Luke doesn’t listen and walks into Vader’s trap in Cloud City. She also saves Luke when Luke communicates through the Force to her. Han Solo – Han is the main character of this film. He goes from the guy who is still selfish and just wants to have his old life back again, but each time rises to help the Rebellion, whether it is saving Luke in the Blizzard or finding the Imperial Search Droid. This eventually leads to him protecting Leia as slowly they fall in love as Han begins to show more awareness towards others from doing insults to treating Leia and C-3PO with only respect. Han learns to listen and in the end he is frozen in carbonite as he has finally found love with his partner Leia. Darth Vader – Vader is driven in this and we see soon learn why as Luke is his son. Everything he does is to bring Luke to him so he can turn him to the Dark Side so he will no longer be alone. There is a sadness to the character in this as we see his scarred body when his helmet is being put on, which gives him vulnerability, though he never stops being ruthless. Whether is is taking over Cloud City, destroying the rebels on Hoth, the torture of Han and Leia to bring Luke and the cutting off of Luke’s hand. Vader is destruction contrasted with vulnerability and it makes him one of the most compelling villains of cinema. Luke Skywalker – Luke grows up a lot in this as we see him discover the Force is not easy to learn and that he has so many hangups he needs get over. In the end we see him mature though as he loses his friends, the Rebellion (when he seeks Yoda for training) Han and in the end his hand and his innocence as he learns he is the son of the Dark Lord Darth Vader. This breaks him and completes the destruction of his worldview that Yoda began when he showed him size and appearance has no bearing on the force. In it he experiences betrayal from Obi-Wan and not telling him the complete truth and the realization that they were right, he was not powerful enough to kill Vader and now he doesn’t know if he ever can as he no doubt still lives his test in Dagoba where his killing of Vader in the forest revealed himself underneath the helmet. That vision hits much closer to home now. Vader is blood and family and was once a powerful Jedi who turned. If Obi-Wan’s best friend turned, than what hope does Luke have? None of this is outright stated but it’s implied in the scenes and drama that unfold in the Duel. The Duel and Reveal – The reveal of Vader as Luke’s father is powerful as is the lead up to it. In it we see how Luke has learned a lot but everything Vader says about the Dark Side being more powerful seems to be true. He walks all over Luke, using the environment against Luke and getting into his head with the final reveal of that vulnerability we saw when Vader was without his helmet. “Together we can rule the Galaxy as Father and Son.” Vader does care even though he is this ruthless machine who sees life, whether it is Imperial or Rebel as expendable…he makes an exception for Luke because there is good in there. The duel is beautiful too as the Lightsabers are light in the dark and mist that covers the areas of Cloud City they fight in. It is my favorite duel of the series without a doubt because it isn’t just great action, it is great action with a purpose. Philosophy of the Force – The Force is all about letting go. It is when the illusions of size, appearance and strength are mastered that you can master the world. This is shown in starting with the basics where Luke’s mind and body and strengthened but he isn’t able to let go as it is fear for his friends that leads to the loss of his hand and in the end he loses one of his friends anyway, showing that Yoda and Obi-Wan were right that leaving would change nothing. The Ending – Han is captured by Jabba, the Rebellion has been chased out of the Galaxy and is on the run and has no safe haven and Luke is left to consider the words of his father and is given his first dilemma…can he kill Vader to save the Galaxy or is that price to high? The Rebellion has a new ally in Lando though as Vader is left to deal with the loss and escape of his son. Okay/Pro: The Droids and Chewbacca – The Droids are alright, same with Chewbacca. They are support roles with R2 saving the day in the end when he fixes the ship so the Falcon can jump to Light Speed. They weren’t bad but compared to all the other characters I found them distracting at times, with the exception of Chewbacca and R2 sometimes. C-3PO was largely annoying. The Emperor – He pops up once to show that Vader reports to a higher power but I never felt threatened by him in any version. He’s a force in the background but we’ve seen the things Vader has done. The Emperor in the Original Trilogy is just there as the symbol of the Empire’s power. He was used much better in the Prequels and his rise, I’d have liked to see him do more but he wasn’t a con. 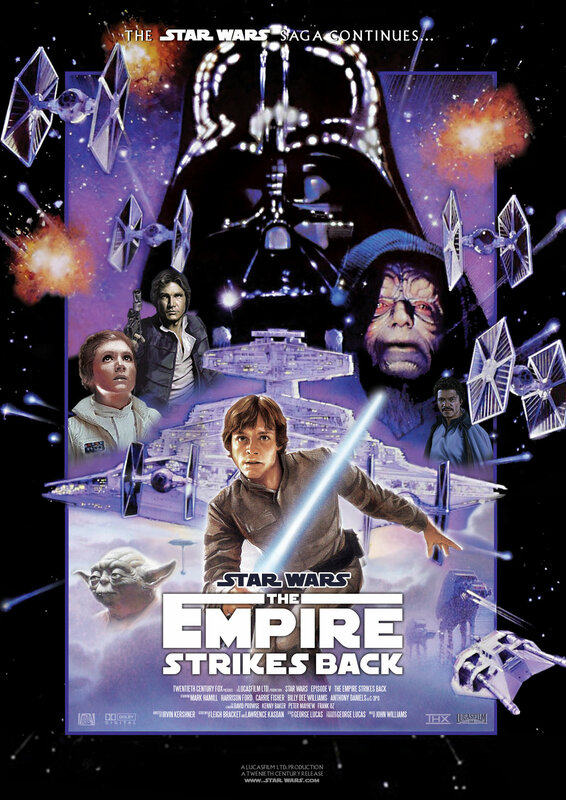 This is my favorite of all the “Star Wars” Films and I’ll be very surprised if “The Force Awakens” manages to beat it. So much is accomplished in this film and we learn so much about all our characters as they are put through their greatest tests and from those tests humanity and growth is revealed. This film is one of my all time favorite films and is beloved by so many for many for the reasons I describe above. Watch the Original if you can, the Ties are distracting in the “Special Edition” as is some of the added dialogue. Less is more and that is what the original version captures as it is wholly focused on our characters and their struggles. Suffice to say, I highly recommend this film. Final Score: 10 / 10. The things that are okay do not bring down the score in this instance as everything else is solid.